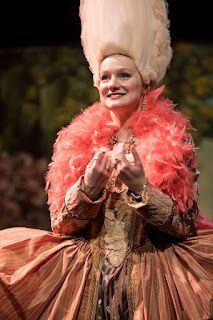 We meet Marie Antoinette in the late 1770s, six or seven years after she was sent to France by her mother, Empress Maria-Theresa of Austria, to marry Louis XVI and become the Queen of France. Her seemingly perfect life of fashion, parties, and friends is marred only by her and Louis' childlessness (and Louis' childishness). Fast-forward ten years and several children later, and Marie begins to confess a loneliness in this life where she never has a moment of privacy, is constantly watched, and feels like she's treated more like an idea or an image than a person. But she's not the only one in France with troubles. As Act I comes to a close, the castle is invaded and the royal family taken hostage by the revolutionaries (with a few mentions of LaFayette, America's favorite fighting Frenchman, that will surely please Hamilton fans). 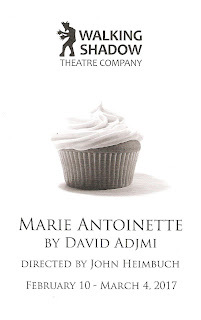 Act II shows Marie desperately trying to escape or be rescued by her Austrian family, unwilling and unable to give up the only life she's known. Or rather, maybe it's just that she can't imagine any other way to live. Jane Froiland is marvelous as the title character, going through the full range of emotions and showing us that there's more to the spoiled queen than just what we see on the surface. She's conflicted, she's lonely, she's worried about her children, she wants to be seen and loved for who she is. 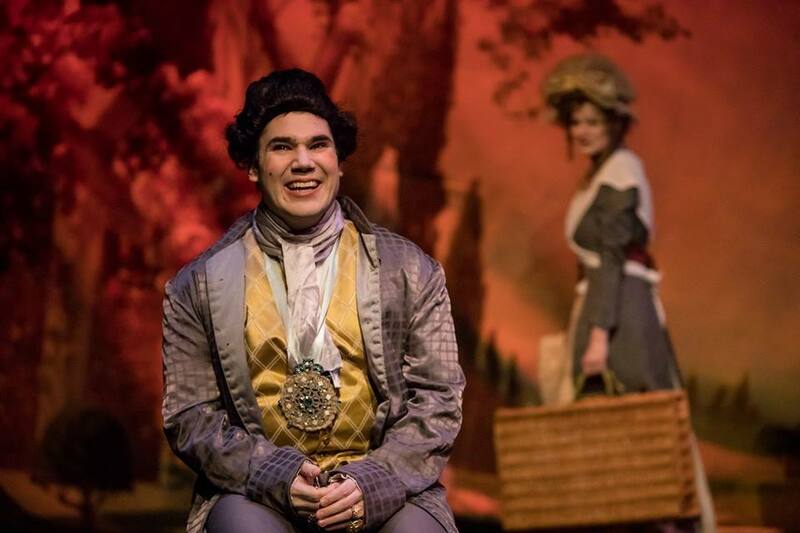 The excellent cast also includes Zach Garcia as the petulant King Louis, Derek "Duck" Washington as the Queen's confident (and lover?) Axel Fersen, Suzie Juul and Teresa Mock as the her friends, David Beukema as her brother the Emperor Joseph, and Neal Beckman as a talking sheep that visits Marie throughout her life (did I mention there's a talking sheep?). Director John Heimbuch and his actors set a tone that beautifully walks that fine line between camp and satire, and real human emotion. I'm not sure if I'm supposed to feel sympathy for Marie Antoinette, whose opulent lifestyle and disregard for the common people inspired a bloody revolution. But in this play I do. Sure she's foolish and selfish, but as she says in the play, that's what she was raised for, that's what she was built for. The monarchy was bound to collapse because "inequality is not natural," but she didn't create the system. Maybe she was its victim as much as anyone else. We are and always have been a celebrity-obsessed culture; in America we've replace actual royalty with entertainment royalty (in fact we just elected one to the presidency). We love to watch celebrities with their glamorous lives, but at the same time we hate them for living that very life. Marie Antoinette was caught up in this system, and yes she used it to her benefit and reveled in the privileges it granted her, but she was also doomed by it. Heavy is the head that wears the crown (and the three-foot wig). 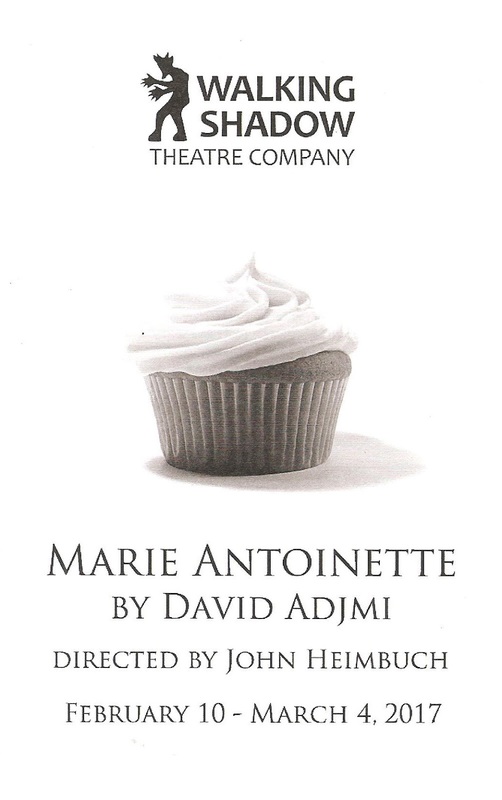 Marie Antoinette continues at Red Eye Theater through March 4. It's a fascinating look at a woman we think we know, but it turns out there may be more to her story than history tells us. And maybe her story is still being repeated today.